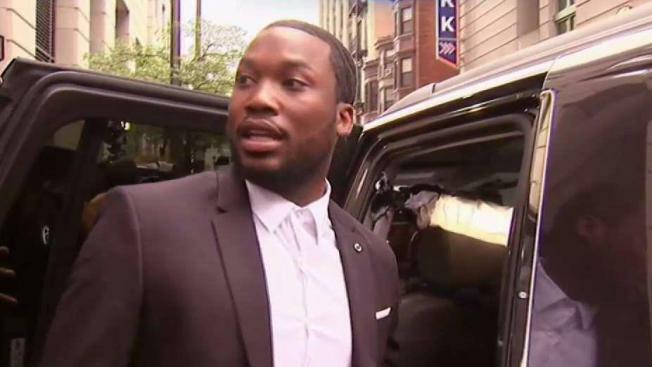 Philadelphia rapper Meek Mill was back in court Wednesday, but his request for a new judge in his case was denied. A supervising judge has denied a request from Meek Mill’s legal team to remove the judge who sent the Philadelphia rapper to prison from his ongoing legal case. Mill and his legal team went to court Wednesday to demand that Judge Genece Brinkley be removed from the case. President Judge Leon Tucker told Mill in the hearing that he doesn't have jurisdiction over the matter. The rapper's attorneys maintain that Brinkley is biased and isn't handling his case ethically. She has strongly defended her impartiality as Mill's legal team has alleged she's been waging a vendetta against the rapper. Mill wants another judge to supervise his probation. One of Brinkley's last rulings in the case called for an evidentiary hearing, set for next month, which could determine if a new trial is warranted. Mill’s lawyers filed an affidavit claiming that in most cases where the district attorney supports a new trial a judge doesn't bother with the extra hearing. The next step for Mill's team is to appeal to the Pennsylvania Supreme Court, NBC10's Aundrea Cline-Thomas reported. Brinkley could recuse herself from the case. Mill, whose real name is Robert Rihmeek Williams, was born and grew up in North Philadelphia. The Pennsylvania Supreme Court ordered his release in April after a long battle dating to November when Mill was sentenced to 2 to 4 years in prison for violating his probation. After his release on bail, he has remained a voice for prison and criminal justice reform. The call for Mill getting a new trial is based on Mill's arresting officer being identified on a list of so-called dirty cops in Philadelphia.